Topic: Congratulations on the Hugo! Re: Congratulations on the Hugo! I admit, I'm probably gonna keep that tab open for at least a day. You know, just in case. D'awwww, they've not had any chances for alone-time till now. They seem a bit friendly for Hill People, whose conversation no doubt consists mostly of "RRAARRGH!" and "GRRRHHH" and the like. Well, that saves them the trouble of having to stop and look for Them. Unless this Them is the Hill People? No idea what kind of rock the shelf-up-towards-France is made of. Could the river have worn it down enough so that the slope is less steep in the time since the Med dried up? Prediction: Beanie Armada with the lifeboat fleet! Megan's bag may well be the one they borrowed from the Beanies, anyway. And for all we know could be a Holy Plastic Relic from the Dawn Time, complete with ziplock. I've tasted (and floated in) the Dead Sea, and the difference between that and a regular sea is very noticeable. If the Mini-Med is that much saltier, then no wonder regular seawater tastes fresh in comparison. His knees are still sticking out of the water though, so I don't think he's fallen down a hole or anything. I still reckon he was trying to float on his back, and is surprised at how little the water supports him now. Maybe he's crouching down to try and lie back and float? OH MY GOD THEY'RE GOING TO DIE!!! Ellipses! I suppose Megan could just be out of breath, but I think here she's just not sure whether to say Sea1 or River2, so had to pick a neutral3 word instead. 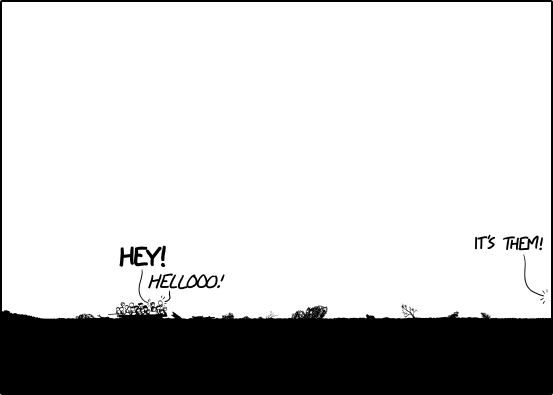 ConfessONG http://imgs.xkcd.com/comics/time/477f7378ad05e102f4326a0eda2143cc633ab8d078e7626fcf689d1f82211fb0.png (my first ONG?) eta: nope, ninja'd! Is she feeling guilty about stealing the map? I can't think what else it would have been, unless she grabbed another thing at the same time. The only interpretation I can think of that fits is that they were creeped out by Rosetta's fatalism, sitting there calmly while telling them that their entire tribe is already dead. That's not inconsistent with the sudden heroic dash. Altimeters must be tech accessible to the Beanies though, as they know about the current sea levels and projected new shoreline, so they must have made an educated guess about the survivability of this castle. I hope! Hard to see Rosetta's arms, but they might possibly be in the "oh noes!" position - I reckon she suddenly looks upset because she has to break it to Cuegan that it's too late. <speculation> maybe they don't use base 10 up here so she can't extrapolate from the <10 numbers she already knows?